The Crucial MX500 is the next generation SATA SSD from Micron's consumer division. As the latest MX series drive, the MX500 is positioned to be a mainstream product with solid performance but without much of a premium over entry-level SSDs. 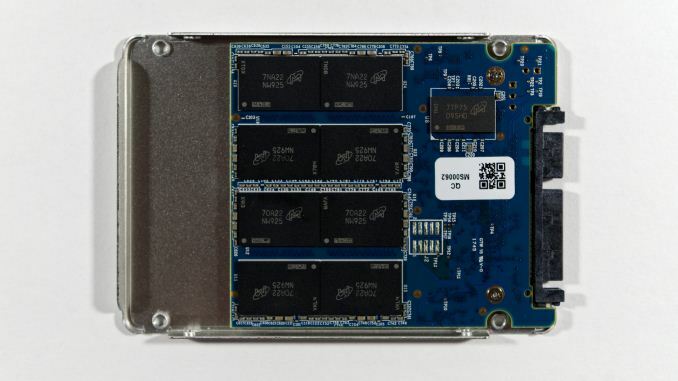 Since Micron has not yet released a consumer NVMe SSD, the Crucial MX500 will also serve as their flagship consumer drive and the showcase for their new 64-layer 3D NAND flash memory. Micron is one of several NAND flash manufacturers to introduce 64L 3D NAND this year. They're a bit late to the party considering that their NAND manufacturing partner Intel introduced started shipping their 64L 3D TLC in a retail drive six months ago, but Micron hasn't missed their chance. All of the major NAND flash manufacturers except SK Hynix are still in the early phases of rolling out their 64L 3D NAND. In a major change from the state of the industry for the past several years, there's no clear leader: Intel and Micron, Toshiba and Western Digital/SanDisk, and Samsung are all putting out products with competitive performance and pricing. The market is up for grabs, and the SATA segment that still makes up the bulk of consumer SSD sales is where the competition is fiercest. To prepare for this next round of competition, the Crucial MX500 brings major hardware changes to what has been a slowly evolving product line stretching back to the first 6Gbps SATA SSD. Micron has struggled a bit in recent years to come up with a clear strategy for their retail Crucial-branded SSDs. Their MX series originally hit the market with the MX100 budget drive that had high enough performance to have very broad appeal. The MX200 tried to move upmarket with increased performance, and the BX series was introduced beneath it as the entry-level alternative. 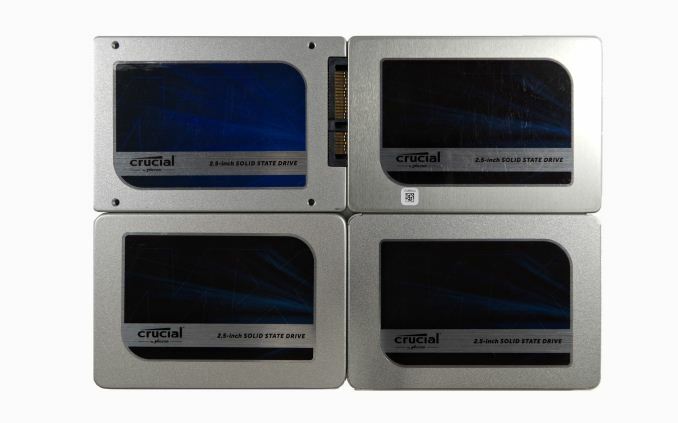 Micron was unable to match the performance of the top SATA SSDs with their Crucial MX200, leaving it very close to the BX100 in price and performance, and their BX200 was a serious disappointment. As the high end of the SSD market has shifted from SATA to NVMe drives, it has become harder to make a case for maintaining two tiers of consumer SATA SSD products. 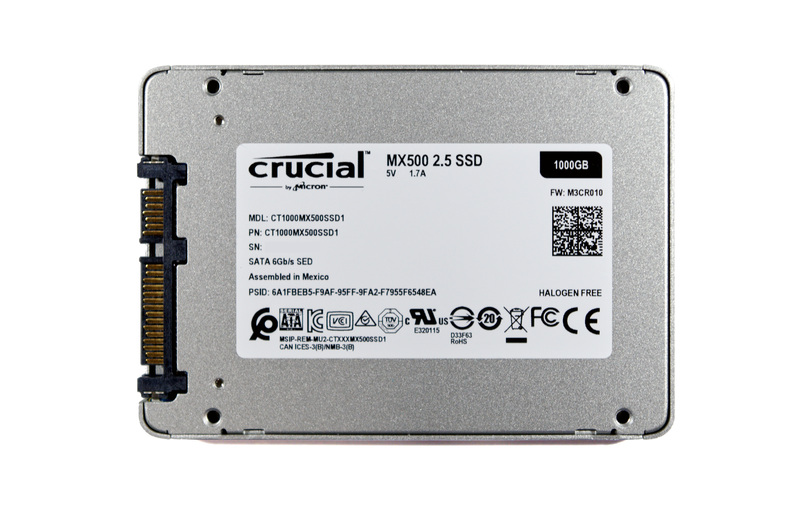 The MX300 has been a solid choice for many use cases and budgets, but it hasn't been able to effectively serve the entire range of the SATA SSD market. Earlier this year, Micron introduced the Crucial BX300 as more of a niche product, specializing in performance at smaller capacities through the use of 3D MLC at surprisingly low prices. Today, Micron is skipping over the MX400 name entirely and introducing the MX500 with major changes under the hood that may allow it to be a solid replacement for both the MX300 and BX300 as they are phased out. The 32L Intel/Micron 3D TLC used in drives like the Crucial MX300 was cheap and low-power, but didn't perform as well as Samsung's 3D NAND so it largely displaced planar TLC products and left Samsung's 850 EVO and 850 PRO almost unchallenged for performance. Our testing of the Intel 545s revealed that their second generation 3D NAND had improved on many fronts, but one model doesn't move the market all that much. The arrival of Micron's 64L NAND in the MX500 means many other companies will soon be using that NAND in their own drives. Micron's launch strategy for the MX500 is similar to their launch of the MX300. We get one capacity today (1TB) and the rest of the lineup will be unveiled soon. The MX300 will be phased out relatively quickly as the MX500 lineup makes its way through the supply chain, but the BX300 will stick around a bit longer. Specific discontinuation dates haven't been provided, but I expect the BX300 to remain in production for several more months at least. Micron hasn't disclosed any plans for a BX400 or BX500 and instead they will probably let the BX line drop again until another niche opportunity comes along like the MX300's weakness at lower capacities. The NAND flash isn't the only significant hardware change the MX500 brings. Micron has broken the trend of using Marvell SSD controllers in the MX series and instead chosen the Silicon Motion SM2258. Silicon Motion controllers have been used in all of the BX series drives and even beyond Micron's products, SMI controllers tend to be more popular for budget products while Marvell's controllers are usually found in more expensive and higher-performing SSDs. Silicon Motion has been working to improve their controllers and move toward the high end, but the MX500 isn't even adopting the newer SM2259 controller Intel uses in the 545s. Micron says that the improvements in the SM2259 are more relevant for enterprise SSDs and that the SM2258 is good enough, when paired with their new 3D NAND. In spite of the completely different controller, the MX500 offers all the standard features of the MX series. TCG Opal encryption is included (making this the first SMI drive we've tested with full self-encrypting drive capability). Micron's partial power loss protection feature for data at rest is preserved, but implemented in a different fashion; they're now also branding it as "power loss immunity". The impact is still the same: you don't get the full protection that is standard for enterprise SSDs, but data that has already been written to the flash will not be corrupted if the drive loses power while writing a second pass of more data to the same cells. This is a feature that can only exist for drives storing more than one bit per memory cell (ie. MLC or TLC, but not SLC), and not using a one-shot programming sequence like is possible with Toshiba/SanDisk 3D NAND. Previous MX series drives have included banks of capacitors to provide power for a short while after an unexpected loss of external power supply. Micron's 64L 3D TLC substantially reduces the need for extra capacitors by offering a much more efficient NAND programing sequence, and by providing significant capacitance within the NAND package itself. The MX500 still includes more capacitors on its PCB than most consumer drives, but they're not as large or numerous as on previous MX series drives. This reduction in BOM suggests that we may see other users of Micron flash implement an equivalent feature in their own products. As with the MX300 and some MX200 models, the MX500 includes SLC write caching to accelerate bursty workloads. Form Factors 2.5", M.2 2280 double-sided 2.5" 2.5"
The performance specifications for the 1TB MX500 don't reveal any particularly interesting changes; most SATA SSDs claim something around these numbers based on unrealistic assumptions about queue depths and I/O sizes. The specs for power consumption have been reduced slightly. The MX300 was very power efficient, but it wasn't reflected that well in its basic specifications. Endurance has increased substantially to 360 TB, above even what the MLC-based 1TB MX200 offered. The warranty period has also been extended to five years, so the drive writes per day rating is not actually any better. The introductory price of $259.99 is a bit higher than what the MX300 debuted with, but is pretty good considering how much flash prices have increased overall since then. Micron's spec sheet indicates there will be a M.2 2280 version of the 1TB MX500, but it will be a double-sided drive. Most manufacturers try to make their 1TB models single-sided these days so they can fit into all the same notebooks that the smaller capacities work with, and Samsung has even managed to make their 2TB 960 PRO a single-sided drive. The 1TB MX500's PCB seems a bit larger than necessary, with 16 NAND flash packages each containing two of Micron's 256Gb 64L 3D TLC dies. With just a four-channel controller, the only reason to split the NAND across so many packages is to save on packaging costs that come from stacking the NAND higher within a package. The partial power loss protection capacitors can be seen encircling the NAND package clusters, rather than being arrayed elsewhere on the PCB. The switch to 64L 3D NAND means Micron is back to a nominal flash die capacity that is a power of two, so the unusual capacities and overprovisioning ratios of the MX300 are gone. The MX500 1TB has the standard capacity for a 1000GB drive, and the flash can be evenly balanced across the controller's four channels. 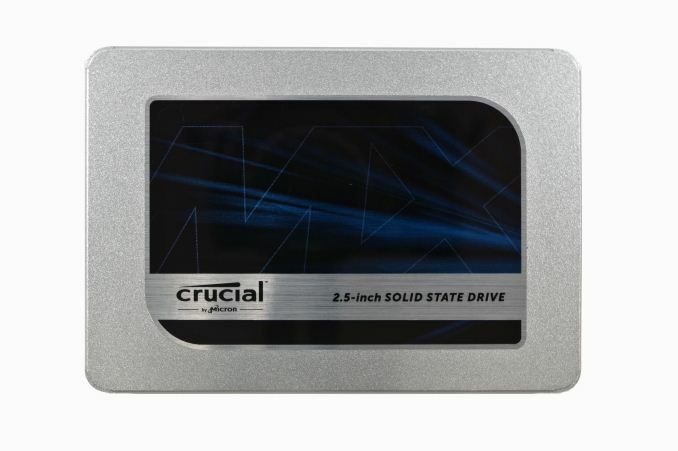 The competition for the Crucial MX500 will consist primarily of other SATA SSDs using 3D NAND. Now that Toshiba/SanDisk 3D NAND is also shipping, we expect most brands still using planar NAND to soon discontinue those products in favor of successors using either Micron or Toshiba NAND. Samsung's 850 PRO and 850 EVO are still among the top SATA SSDs and the 850 EVO has at times offered great performance for its price, but they're no longer alone at the top. The Intel 545s uses Intel's version of the 64L 3D TLC in the MX500, along with the Silicon Motion SM2259 controller. The Western Digital WD Blue 3D NAND and its alter-ego SanDisk Ultra 3D use SanDisk's 64L BiCS3 3D TLC NAND along with a Marvell controller, and also threaten Samsung's dominance in the SATA SSD market. Toshiba's retail SATA SSD with 64L 3D TLC is the TR200, which uses a rebranded Phison S11 DRAMless controller, making it more of an entry-level product with limited performance potential. Amidst various hardware swaps to support other SSD testing projects and the integration of our new Quarch XLC Programmable Power Module, something got screwed up with our primary SSD testbed that is causing The Destroyer to proceed at less than half the usual pace. Since the test normally takes at least 12 hours for a SATA SSD to complete, this isn't something easily debugged over the course of just a day or two. This issue is affecting the MX500 and the few other drives I've had time to attempt running The Destroyer on recently, so this review will be missing results from that test until I can get the testbed re-imaged and collect and validate new performance results. The other tests in our suite seem to be unaffected, and the MX500 results that appear to be outliers have already been double-checked. Just to expand on this. Samsung is forcing customers to contact newegg for warranty coverage. I've already spent weeks just trying to get Samsung to respond to their normal emails. Newegg obviously isn't responsible for a year old drive failing. They have no RMA process, and I've already contacted their chat, voice, and email. We have received your email and would like to thank you for the information that you sent us however, you will need to contact the place of purchase for warranty coverage. We already have notify the dealer and they will be calling you shortly to offer warranty coverage. We apologize for the inconvenience this issue may have caused you. Interesting. Over here in EU it is far more common to deal with the seller/store.